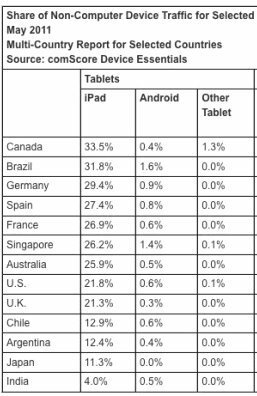 If you’ve wondered exactly how all the tablet competitors stack up against the iPad, perhaps one of the best places to gauge this comparison is to look at where tablet web traffic is consumed. ComScore just released data that shows the iPad accounts for 89% of global web traffic via tablet devices. This means all the other tablet competitors – Android tablets, Blackberry tablets, Tablet PC’s, etc… – make up the other 11% of web traffic.